It is extremely important that businesses in the food industry take extra care to monitor the cooling of hot foods in order to prevent the risk of bacteria growth. Once an item of food has dropped below 63ºC and remains above 5ºC, bacteria can be produced exponentially. The growth of bacteria can cause food spoilage and food poisoning, so it is essential that food should remain within the danger zone for as short a time as possible. Working kitchens are naturally warm places and temperatures remain well within the danger zone. 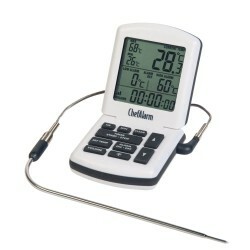 This makes temperature control in the kitchen an important factor in preventing food poisoning. There are a number of steps food businesses can take to speed up the chilling down of hot foods and ensure kitchen staff can effectively monitor how long food items remain in the danger zone. Food law dictates that food processors chill foods down to 5ºC, within 90 minutes of reaching 63ºC. Common food poisoning organisms (with very few exceptions i.e. listeria) are not able to multiply below 5ºC or multiply at a very slow rate. Therefore it is important that all refrigeration units operate below 5ºC (ideally 3ºC). This may extend the shelf life of food by a few days and also prevent food poisoning organisms from multiplying. Deep freeze units must keep food below -18ºC. Temperature monitoring equipment can be used to alert kitchen staff when a food item hits the danger zone, and another alert when the food item has hit the time limit of 90 minutes. This allows staff to monitor the length of time a food item remains in the danger zone and allows them time to take action to ensure the items reaches 5ºC within the 90 minutes. The Chef Alarm from ETI is a fantastic solution in monitoring food products within the danger zone. This product has multiple functions and has a built-in alarm with a stopwatch. This means the user can set an alarm to notify them once a food item hits 63ºC, and then set a stopwatch to alert them again once the time period is approaching 90 minutes or the once the item has reached 5ºC. Another technique food producers can use to speed up the process of chilling down hot foods is to increase the surface area on which the items are cooling and ensure small quantities of a product are left to cool separately. This can speed up the process of cooling by preventing the product from retaining heat in large quantities. For foods stored within items such as a pan, it is advised to cover the pan and move it to a colder area. This could be a storage room or even place the pan in cold or icy water, this will speed up the process of chilling. The process of stirring the product will also decrease the time needed in order to chill hot products by increasing air flow through the product. These are a number of techniques food processors can implement to reduce the amount of time it food remains in the ‘danger zone’ between 63ºC and 5ºC. If you would like any further advice on this topic please don’t hesitate to get in contact on 08450 267 745.